The guy's name is Harry Lawson, right? The guy’s name is Harry Lawson, right? Recently looked at a sheet that was unidentified. It’s early and nicely drawn. We wanted to try and identify the author, if possible. There’s a date; May 20th 1930 written in pencil and erased under the eagle wings of the crossed equator design. Which caused us to look further. Scotty in the Lift Trucks Lab found another erased set of letters at the bottom of the sheet. Looked like “…rry V Law…n. He then looked at it a different way by flipping colors on the computer to a negative. Almost like a blueprint. You can see it clearly in person, not so much in the photo (apologies.) But you get the idea. All falls into place and says in all caps; HARRY V LAWSON. Not a bad way to check for signatures on a sheet. Flipping some colors will work better than others. Old computers sometimes have a color matrix rotation system button. On newer models, try Photoshop or iPhoto and swap out one color for another. One tell was the unique style of feathered shadows under the feet of the women. A black line with fade cast. This is on other Lawson’s in a book. 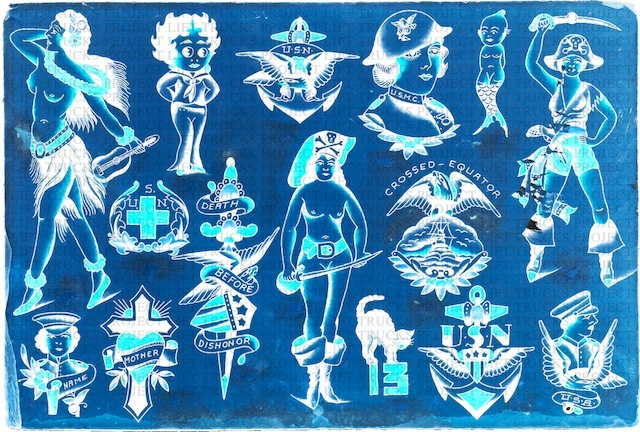 Shows up here on the ukulele girl and pirate lass giving stylistic evidence, along with the block letter signature, that sheet is most likely by Harry V. Lawson. 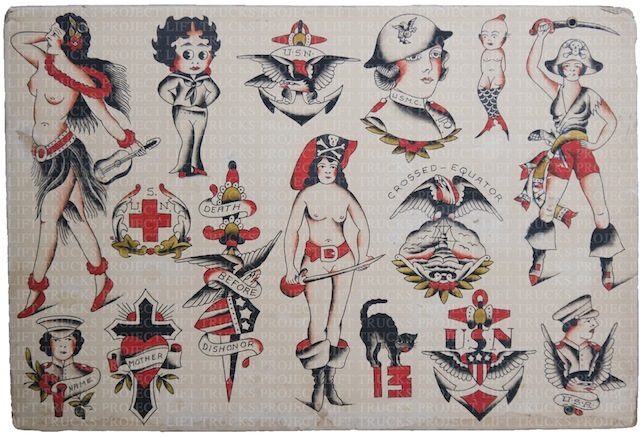 Maybe another reason to dig back into into the slag heap of unidentified tattoo flash sheets. This entry was posted in Uncategorized and tagged Forensics, Harry Lawson, Harry V Lawson, Owen Jensen, Tattoo Art, Tattoo Flash. Bookmark the permalink.